NIC-3210PF-SFP is a USB3.0 fiber optical adapter developed by Cablexa. It is independently researched and developed by Cablexa R&D team and is widely applied in high-end application occasion by the high-end customer cluster. NIC-3210PF-SFP is completely different from the mini NIC with plastic shell in nature. It is unique in current market due to aluminium shell to ensure the high performance of USB3.0 fiber NIC with specific appearance design. It can be either upright or horizontal as you like. The elegant appearance can enhance the glorious outlook in the office. Besides, aluminium shell has the good thermal dissipation overcoming the shortage of the plastic shell to ensure the reliability and working stability, it offers well-deserved reputation of classic in the market. 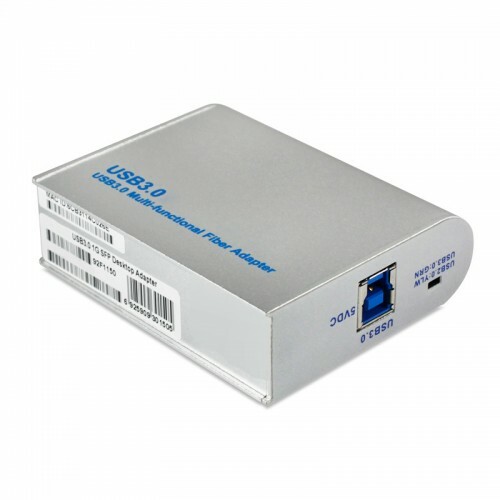 NIC-3210PF-SFP can solve the problems arising from the traditional integrated computer that fiber access can be realized only by fiber transceiver (transfer from light signal to electronic signal). Cablexa offers optimal design in adopting small pluggable slot that can be compatible all SFP gigabit modules through exchanging SFP modules to maximize the usage needs for various networking environments. By testing, under USB3.0, transmission rate will reach to the maximization of gigabit speed 1000Mbit/S so as to accord with the huge data transmission requirements. NIC-3210PF-SFP based Realtek RTL8153-CG 1000M Ethernet controller combines an IEEE 802.3u compliant Media Access Controller (MAC), USB 3.0 bus controller, and embedded memory. With state-of-the-art DSP technology and mixed-mode signal technology, the NIC-3210PF-SFP offers high-speed transmission over CAT 5 UTP cable or CAT 3 UTP (10Mbps only) cable. Functions such as Crossover Detection and Auto-Correction, polarity correction, adaptive equalization, cross-talk cancellation, echo cancellation, timing recovery, and error correction are implemented to provide robust transmission and reception capabilities. NIC-3210PF-SFP features USB 3.0 to provide higher bandwidth and improved protocols for data exchange between the host and the device. 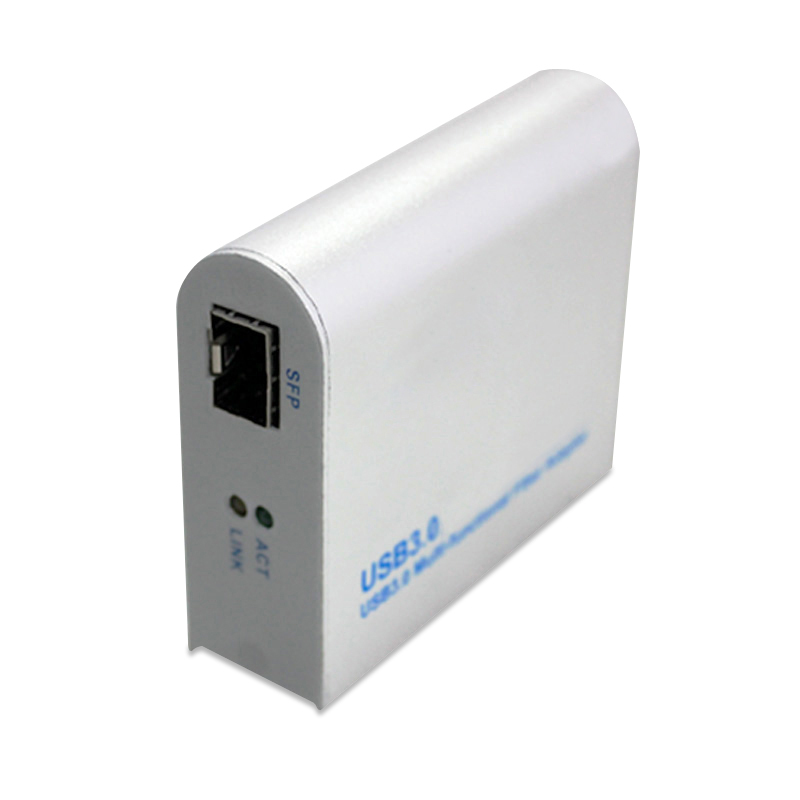 USB 3.0 also offers more advanced power management features for energy saving. NIC-3210PF-SFP Advanced Configuration Power management Interface (ACPI)—power management for modern operating systems that are capable of Operating System-directed Power Management (OSPM)—is supported to achieve the most efficient power management possible. In addition to the ACPI feature, remote wake-up (including AMD Magic Packet and Microsoft Wake-Up Frame) is supported in both ACPI and APM (Advanced Power Management) environments. NIC-3210PF-SFP supports Microsoft Wake Packet Detection (WPD) to provide Wake-Up Frame information to the OS, e.g., PatternID, Original PacketSize, Saved PacketSize, Saved Packet Offset, etc. WPD helps prevent unwanted/unauthorized wake-up of a sleeping computer. NIC-3210PF-SFP supports Protocol offload. It offloads some of the most common protocols to NIC hardware in order to prevent spurious wake-up and further reduce power consumption. The NIC-3210PF can offload ARP (IPv4) and NS (IPv6) protocols while in the D3 power saving state. NIC-3210PF-SFP supports the ECMA (European Computer Manufacturers Association) proxy for sleeping hosts standard. NIC-3210PF-SFP supports IEEE 802.3az-2010, also known as Energy Efficient Ethernet (EEE). IEEE 802.3az-2010 operates with the IEEE 802.3 Media Access Control (MAC) Sublayer to support operation in Low Power Idle mode. When the Ethernet network is in low link utilization, EEE allows systems on both sides of the link to save power. NIC-3210PF-SFP is fully compliant with Microsoft NDIS5, NDIS6 (IPv4, IPv6, TCP, UDP) Checksum features, and supports IEEE 802 IP Layer 2 priority encoding and IEEE 802.1Q Virtual bridged Local Area Network (VLAN). The above features contribute to lowering CPU utilization, especially benefiting performance when in operation on a network server. NIC-3210PF-SFP is suitable for multiple market segments and emerging applications, such as desktop, mobile, workstation, server, communications platforms, docking station, and embedded applications.